This is a four pack of chelating, cleansing, repairing, and moisturizing shampoos/conditioners. I love this because it is so easy to use! All I do is put on the individual cleansers for 5 minutes each (you can shorten the times) and I get soft, strong hair! I don't even have to blow dry it afterwards! My hair is significantly less frizzy after using the 17 Minute Miracle. 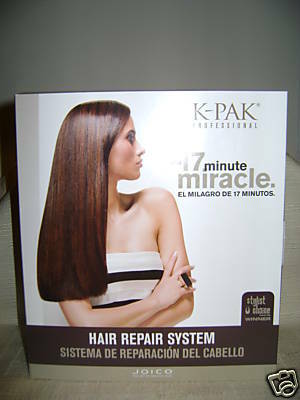 The effects last for about a week, but if you treat your hair once a month, the effects begin to last longer and longer. You also don't need to use a lot. I have used this product four to five times and I have only gone through about a quarter of the bottles. I would definitely reccomend this to anyone who wanted to improve the quality of their hair, or maintain it!